Malala Yousafzai was born in 1997 and grew up in the northwest Swat Valley region of Pakistan. As a child she was fortunate to have access to education because her father, Ziauddin Yousfzai, operated a private girls school in her hometown. This part of Pakistan was under Taliban rule and they did not believe that girls should have an education. When she was 11 years old Malala wrote a blog essay for the BBC British television network describing what it was like living under Taliban occupation. This story appeared in a New York Times documentary, and it got a good bit of attention in print and on television. She was nominated for the International Children’s Peace Prize by Bishop Desmond Tutu. Unfortunately, all this attention made her a target of the Taliban. On October 9, 2012, she was attacked and shot in her head by a masked Taliban gunman. Miraculously she survived the assassination attempt and was sent to England for treatment. This horrific act of violence against a young girl created overnight a huge outpouring of support for her cause. After her recovery she became an international speaker for the rights of education for all children, especially girls. In 2014 Malala became the youngest person ever to receive the Nobel Peace Prize. As a result of her advocacy, the United Nations passed a petition in her honor that led the country of Pakistan to ratify its first ever “Right to Education” bill. She has established a nonprofit organization that raises funds to provide education for girls, and she has written a number of books. In 2015 she opened a school in Lebanon for Syrian refugees. Currently, this bright, dedicated, inspiring young woman is enrolled at the Lady Margaret Hall (College) in Oxford, studying for a bachelor’s degree in philosophy, politics and economics. There is no telling what she may do and accomplish in the future, but we can guess that it will be beneficial to young people. I give thanks for this courageous young voice and visionary in our world, who believes in the education of girls and the opportunities that come with freedom and justice for all people. Many of our United Methodist missions around the world focus on the education of girls; and our global society has reaped the benefits of these efforts ever since. Only when everyone is respected as equal and equally able to access education, health care and the basic needs of life can the entire world begin to thrive and be at peace. 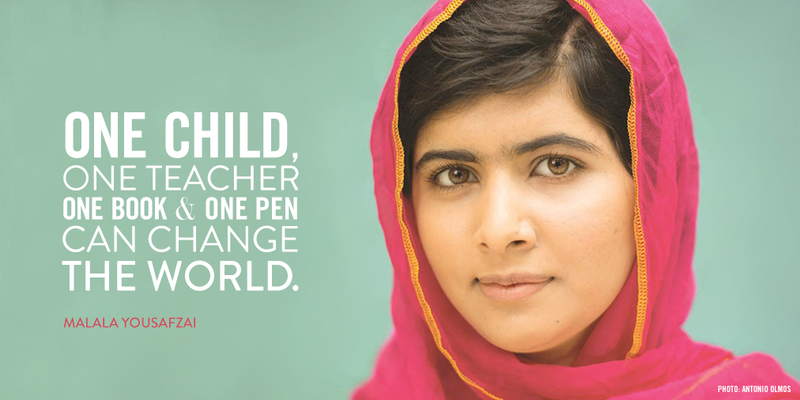 Malala is a shining example of a young person who is changing the world. 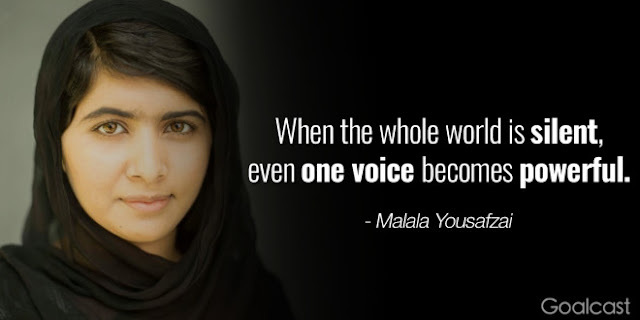 Just as she tells us, we should never underestimate the power of one voice, especially of one who bravely speaks out for justice and human rights. Happy Women’s History Month!